I was flipping through pages of Southern Living magazine from last year, when I stumbled upon a suspiciously easy recipe for Dulce de Leche. It was made of sweet tea. I didn’t have sweet tea. I always have coffee. That’s what wakes me and my Hubby up in the morning. Except Sundays. That’s when our kids wake us up jumping into our bed! Aaaaaanyways, adventurous baker that I am – I decided to use coffee in the recipe. Enter Mocha Dulce de Leche. May I just say: this stuff is gooooood!! I decided to use it in my next baking project that I will share on Wednesday, but this stuff deserves a post of it’s own. One thing you should know before making this: letting it cool for at least 12 hours in your fridge ( overnight is the best ) will make it very thick, like the real Dulce de Leche. In a medium saucepan, bring the coffee to a boil. Add the sugar and whisk until dissolved. Cook for 15 minutes on medium-low heat, until it becomes syrupy. Add the cream and whisk until smooth. The mixture will be very thin but it will thicken up as it cools. Transfer into a jar and refrigerate 12 hrs or overnight. Mocha dulce de leche is pure genius! I love the idea. DULCE DE LECHE!!!! LOL my addiction and it is on your blog!!! Make a girl go crazy over this lol. Oooo this sounds so good. My husband is in love with anything coffee and would adore this! 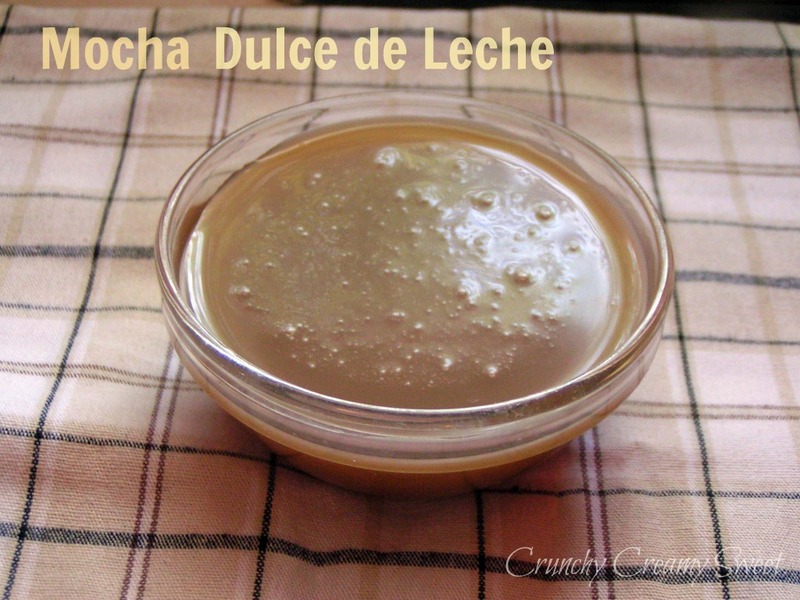 What a great idea to make dulce de leche with coffee! Love it! Love the idea of having coffee in DDL! Sounds very yummy! Yay! Thank you so much, Zoe! Please do, you will love it! Thank you, Cathleen! Oh my goodness girl stop making me drool! Deliciousness! I live off coffee…. this sounds perfect. I can totally think of a million things to make with this. Yum! Oh yes! Me too! Thank you, S.V.! This looks amazing! I’m totally making these this week. Yay! Please let me know how you like it! Thank you! Mocha sounds so much better than the original tea version! So YUMMY!!! Yay! I am so glad you like it, Lizzy 🙂 Thank you! Thank you so much, Kit! I love this!!! so great – easy and delicious!!! Thank you so much, sweet Mary! Hi Neshanne! Welcome to CCS! So happy to have you here 🙂 Yes, you will want to put it on everything! It's amazing:) Thank you so much! I'll be back on Wednesday! This looks like it tastes wonderful – I can't wait to see what you use it in! This is fantastic! My mind is reeling thinking of all the wonderful things I can make with this. Now I am wondering if you are going to make something with this. I much better like the coffee than the sweet tea, so bravo for you on making the change. I was looking for a coffee flavored type of syrup a few weeks ago. Ha-they had bacon syrup but no coffee. Anyhow thanks so much for sharing this! As soon as I tasted it – I thought the same! Possibilities are endless! I do hope you try it 🙂 Thank you, Tina! oh this is such a cool idea! i need to try this!